Growing up, my dad was really into science and experimenting. He’d work for hours in his basement lab, conducting research and testing hypotheses. He once made a handmade radio that accidentally cut service to a section of Detroit’s TV, phone and radio signals. His science fair experiments — which he conducted for “fun” — would always place first and move him on to higher contests. Family Man or Mad Scientist? In more recent years, my dad started a new side project building a lakeside vacation house for our family about an hour and a half away. His only time to work on it was really the weekends, but with his dad in his late 90’s, he made sure to spend every Sunday visiting his father and then spending time with his grandkids. It’s been 2.5 years since he started the lakehouse, and he could’ve finished it in half the time had he spent Sundays out there building. But he knew his priority was spending time with his dad. 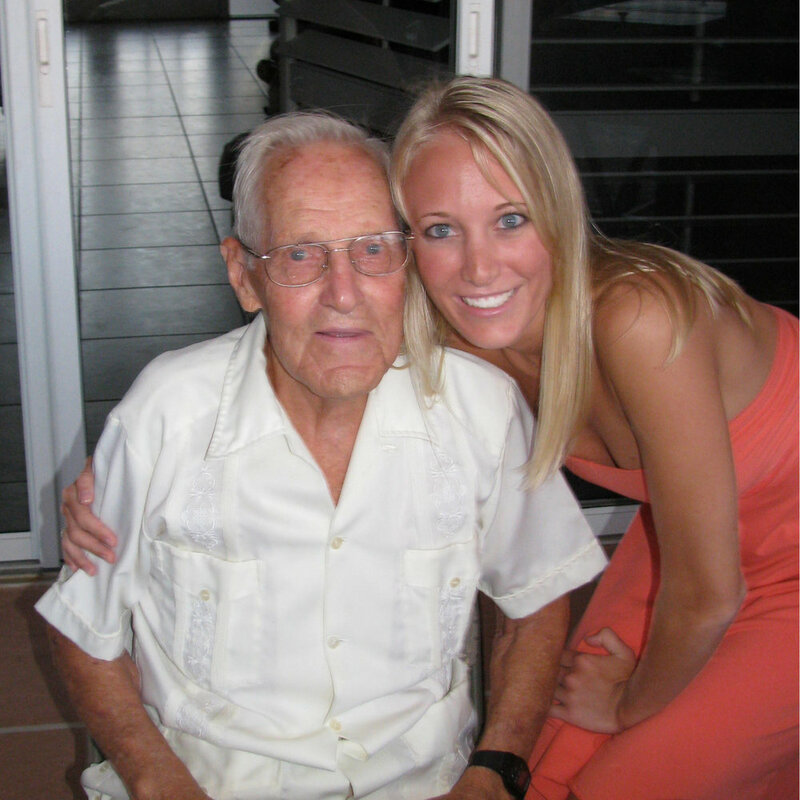 And when Grandpa passed in his sleep at age 97 with a perfectly healthy brain and just a few creaky bones, my dad had no regrets. Had he waited until Grandpa was in critical care to spend weekly visits with him, well, that moment would never have come. He would’ve missed out on all those lazy Sunday afternoons watching football and Nascar with his dad. The point is, we all have choices as to who we WANT to be. Sometimes I feel in my bones that I was destined for so much more than what I’m turning out to be. My design skills could’ve led me to some hot shot job in New York City or a coveted position at IDEO. Or I could be a hot-shot business coach putting on big conferences and events. And while I often battle the urge to be more and do more, I know that’s not what will make me happy. I tried the whole “hustle” thing and it was wearing me out. I missed spending time with my family and having nights and weekends off. I missed having down time and relaxation. I missed doing service projects and acts of kindness towards others. I missed taking road trips or hanging out with my husband WITHOUT my laptop open. It took a weekend away from clients and distractions — a Bosscation — to soul search and discover what I really wanted in life and business. The path I was on clashed with the destination I really wanted to aim for, and I had to make some changes! These changes included letting go of my workaholic tendencies that cared more about scaling my business than nurturing myself and my relationships. So yes, my business may never make a million dollars, or even make 6-figure years. But I’m OK with that. I love the path that I’m on, the freedom and flexibility I have, and the lack of stress in my life. And if you'd prefer the hustle, there's no shame in that! Just be clear on what you're aiming for so you can take the right action steps to get you there. 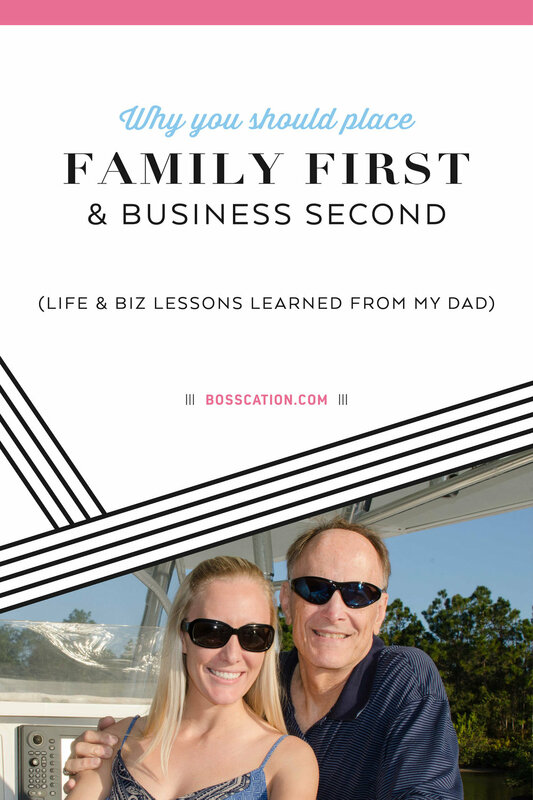 As I go to start my own family, I know I need to follow my dad’s example of family first. One of my biggest fears is raising a child that doesn’t know or feel loved or that they’re a priority, because I’m too buried in my business. And while I want to provide my children with nice things, I know from experience that it’s better to have little possessions and lots of love than the opposite. My dad is one of the hardest workers I know, because he doesn’t waste time on the non-essentials. That way, he can make the most of the hours he works and then stop and make time for his loved ones. I’ve been trying to follow his example in my own life and business. Prepping my business for the arrival of baby Carson! Photo by Molliner Photography. At the beginning of my pregnancy, I shared my pre-baby to-do list with my mastermind, and it was about a mile long. I had plans to prepare 6 months’ worth of blog, video and email content before the baby came. I wanted to create at least 2 new strategy guides and a shop full of digital downloads. I had intentions for adding partnerships and training programs. But between my insomnia and pregnancy fatigue, I was on the verge of depression and knew that my mental health and the health of my baby were my top priority. I accomplished what I could, and gave myself grace for the rest. Do you give yourself grace when you need it? If you need to give yourself grace or discover what your path should be, I suggest that you take a Bosscation — some time away from clients to work ON your business! Set yourself up for success and free up more time for family by discovering where you should be spending your time, what your true desires are, and how you can make your business more efficient. Grab our free solo business retreat planning guide to plan out your Bosscation solo business retreat. You're in! Check your email to get your free download!